Repeated squinting in the sun, frowning in concentration, even smiling too often can lead to the appearance of fine lines which if not treated early, will eventually lead to wrinkles and deep folds in the skin. 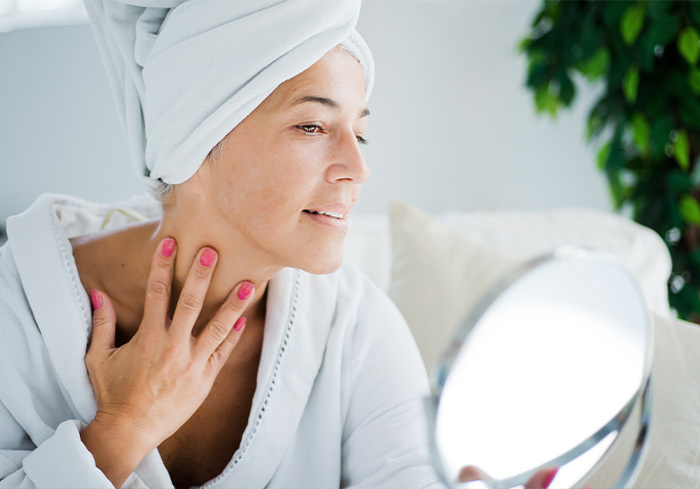 Sun damage or dry skin can also make fine lines appear more pronounced as the skin lacks the moisture needed to fill and smooth your complexion. Dull skin tone really comes down to diet. Remember, your skin is an organ, in fact, it’s your largest organ, and like the rest of your body, it needs to be fed healthy nutrients. Not drinking enough water, overindulging on alcohol, smoking and fatty foods all contribute to a dull skin tone, as does a build-up of dead skin, so making sure you’re exfoliating regularly. Your pores will naturally expand as you age but you can inadvertently speed the process up by not taking care of your skin. A build-up of oil, dead skin and congestion can all cause your skin to swell and your pores to appear larger, as can excessive sun exposure by damaging your skin’s elasticity and depleting collagen. Like with enlarged pores, excessive sun damage can breakdown skin elasticity and collagen, resulting in volume loss long before you should be experiencing it. Extreme exercise and weight loss can also contribute to the condition. Tell-tale signs of volume loss are sunken looking cheeks and eyes. Once again, excessive sun exposure is the leading cause of premature pigmentation (brown spots and freckles). So, remember to slip, slop, slap! If you suffer from any (or all) of the above, then fear not, it’s not too late to restore your skin to its chronological age. A treatment such as Clear + Brilliant® is a great way to stimulate collagen, elastin and hyaluronic acid. A fractionated laser that gently penetrates the top layer of your skin a fraction at a time via hundreds of thousands of microscopic columns, Clear + Brilliant® repairs, remodels and resurfaces your skin, shrinking pores, lightening pigmentation and reducing the signs of ageing. It’s a great treatment for premature ageing, or for someone looking for total skin rejuvenation.